After a couple years of thinking about riding Spokefest I finally got around to participating in the third edition this year. Spokefest for the uninittiated is a 9, 21, or 47 mile bike ride (not race) that starts in Downtown Spokane and runs along the Spokane river. With 1500 riders the first year and now over 2000 just two years later, it’s quickly growing into another well supported Spokane community event in the vein of Bloomsday and Hoopfest. This year I opted to ride the 21 mile course with my friend Jesse. Initially the 47 mile course seemed like the ride I should do, but upon further reflection I realized I ride by myself all the time and it would be fun to just do the middle distance with Jesse since that’s what he was going for. Besides the 47 mile route is still there waiting for me if I ever care to ride it. The ride itself was pretty fun and a nice change from the solitary riding I do most of the time. Jesse and I started pretty far back in the green starting section so it took several minutes to get up to speed. Once we got going the pace was a very relaxed 18-20 km/h until we hit the first climb up Riverside to Government Way. As much as I enjoyed riding in such a big mass of cyclists I was looking forward to hitting some of the hills and thinning things out a bit. The only problem was that most of the riders that were challenged by those hills weren’t experienced enough to think about getting over to the right side of the road once they hit them. So there was a bit of dodging and weaving as we worked our way up the climbs into Riverside State Park. By the time we reached the chaos of the turnaround rest stop it was finally starting to warm up so we stopped to remove some layers and then got going again pretty quickly. Riding back into town along the river was a lot more appealing than fighting the crowds for orange slices and whatever else the various booths out there had to offer. Our pace picked up a little bit on the way back into town on the Aubrey White Parkway and while there were still cyclists all around we were a bit more spread out. Unlike most of the riders around us I was actually pretty excited to get to Doomsday Hill. I hadn’t ridden up it in over a year, I’m in as good of climbing shape as I’ve ever been, and it’s far and away the most overhyped climb in Spokane. So I attacked it with some pretty serious gusto. Unfortunately they kept both lanes on Doomsday open to car traffic this year and some nimrod in a silver RV honked at me because I was pretty far out in the right lane trying to pass all the slow people overflowing the bike lane. It definitely seems like they should have coned off half of Doomsday just like they did with Government Way. At any rate, once I got to the top I caught my breath and briefly waited for Jesse to catch up. 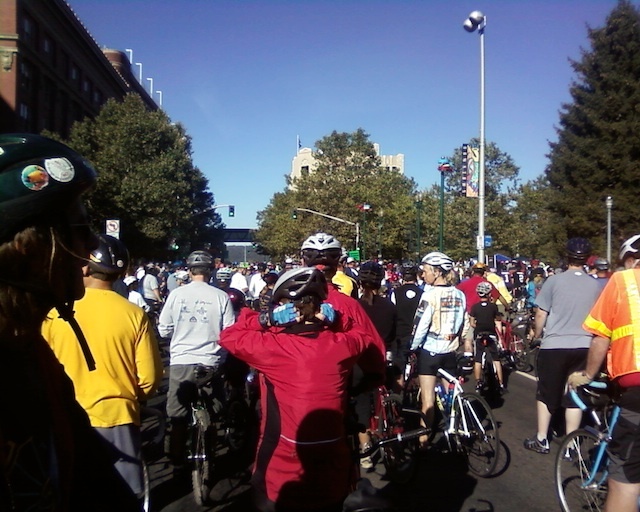 The rest of ride was pretty uneventful and we rolled into the finish at Riverfront Park right around 11 am. I’m already looking forward to next year. It’s going to be a few more years before the kids are ready, but maybe I can get Mary to come along too in 2011.